All breakfasts and 7 evening meals. 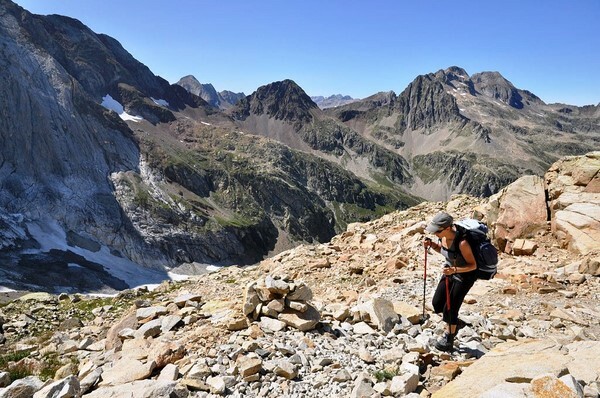 This self-guided walking holiday is the third part of a wonderful & dramatic 415km crossing of the Pyrenees Mountain chain between the Atlantic and the Mediterranean along the GR10 long distance trail. You'll amble through stunning scenery that varies enormously, with flower filled meadows, sparkling lakes, cirques and high summits. You’ll get a taste of many different cultures, from the Basque country by the Atlantic to Catalonia by the Mediterranean. Each valley you pass through has its own distinct flavour. 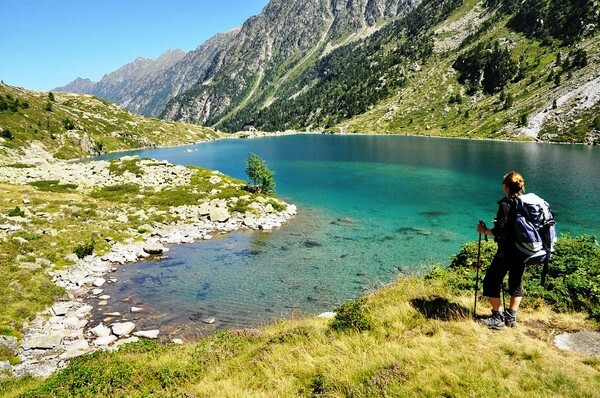 This section of the GR10 long distance trail goes from Etsaut to Cauterets, taking you through the Pyrenean National Park. Created in 1967 to preserve an exceptional natural heritage, the park stretches from the Aspe valley to the Aure valley, along the Spanish border. Setting off from Etsaut, via the famous chemin de la Mature, you will reach the grandiose surroundings of the Ossau valley, that opens out before you and affords a spectacular view of the pyramid-shaped Pic de Midi d’Ossau that culminates at 2884m. From Gabas to Arrens valley, passing through the ski resort of Gourette, you encounter a succession of lakes and villages in stone and slate and a never-ending wilderness that serves as summer pastures. After having discovered the Arrens and Estaing valleys, you finish your week's self guided walking holiday in the Pyrenees spa town of Cauterets, capital of the Bigorre. 6 days independent walking moving everyday between hotels and two mountain huts. It is graded strenuous, although the average days include 6 - 7 hours walking and 900m of ascent & descent. The hardest two days, however, both include over 1500m of ascent. Details are provided with the descriptions below. Paths are generally good and well defined, although they are often rocky and mountainous in character. You should have a good head for heights and be able to navigate. Once you have settled into your accommodation in Borce (just next to Etsaut) you can visit the villages of Etsaut and Borce and the Park's mansion. Easy hike in shady loop up to the Moulette bridge, in the forest to discover high barns. 5km (2hrs15), +300m, -300m. A circular walk that lets you discover the valley of Etsaut. You will discover lovely scenery as well as relics of the past, such as old mills and barns. You arrive at Col de la Coundre at an altitude of 1121m. 6km (3hrs30), +525m, -525m. Today’s walk is challenging with 1550m altitude gain. It offers scenery of an amazing magnitude: the Chemin de la mature, the plateau of Baigt-Sencours, shepherd’s cabins and the pyramid-shaped mountain the Pic du Midi d’Ossau whose reflection shimmers in the waters of the lake, Lac Gentau. 15km (6hrs), +1550m, -300m. Setting out from the refuge at Ayous, the GR10 drops down to the village of Gabas. Today's walk is shorter and it's a chance to recuperate after yesterday's efforts (or longer variants). The distance from the lake to the village isn’t far and will take about 3 hours. The village is typically Pyrenean and situated in the famous valley of Ossau, with an emblematic summit, an exceptional flora and fauna, as well as great cheese! Possibility of two different longer variants: via Lac Bersau or via the Col de Suzon. Distance : 10km, duration : 3h00, altitude gain : +20m, descent : -940m. Distance : 13km, duration : 4h15, altitude gain : +175m, descent : -1105m (Variant Lac Bersau). 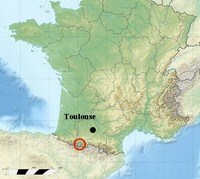 Distance : 19,5km, duration : 7h15, altitude gain : +850m, descent : -1780m (Variant Col de Suzon). In the morning, transfer from Gabas to Pont du Goua or Eaux Bonnes to shorten the hike (optional, contact us). Today’s walk is strenuous, the climb up to the Hourquette d'Arre which culminates at 2465m, being the highest part of the GR10 in the Pyrenees Atlantiques. You descend towards the lake Anglas and continue down to Gourette. There is a good chance that you will be able to observe some remarkable fauna such as the majestic rare vautour fauve, vultures, royal eagles, mountain isards and marmots. Late snow covering is regular on this stage : a variant enabling to avoid the high point of Hourquette d’Arre can be organised. Possibility to divide the hike in 2 by adding an extra night, please contact us. Distance : 17,5km, duration : 7h15, altitude gain : +1500m, descent : -1100m (with standard Pont de Goua transfer). Distance : 10km, duration : 4h, altitude gain : +300m, descent : -900m (with Eaux Bonnes transfer). Distance : 23,5km, duration : 8h30, altitude gain : +1750m, descent : -1400m (Snow variant with standard Pont de Goua transfer). Today’s stage of the GR10 is a transition; the trail crosses the border between the Bearn and Bigorre regions. You will be walking across high summer pastures and past shepherd's cabins to the Col de Tortes at an altitude of 1799m and on to the Col de Saucede at 1525m. You will arrive at the village of Arrens in the Val D’Azun valley, the first market town of the Bigorre region. Then you will reach the village of Estaing via the Borderes pass. Distance : 16,5km, duration : 6h50, altitude gain : +1050m, descent : -1350m. The GR makes its way up to the high plains of the Col d’Ilheou, passing the cabins of Arroussec and Barbat. The col is situated at an altitude of 2242m, from which point the trail drops down to the lake of Ilheou. Distance : 14km, duration : 5h30, altitude gain : +1250m, descent : -350m. Just a short walk for the last section of this part of the GR10. To Cauterets, passing by the Escala d’Ilheou, you'll no doubt have the chance to see marmots and isards. In this high, airy mountain ambiance there are many traces of glacial erosion, lakes and moraines. Possibility of a longer variant via the Haugade Pass and the Marcadau Valley. Distance : 8km, duration : 3h, altitude gain : +10m, descent : -1070m. Distance : 16,5km, duration : 6h, altitude gain : +550m, descent : -1450m (variant). - Evening meals in hotels and huts are often local specialities, include a starter, a main course and a dessert. - Picnics and drinks not included. Picnics can be ordered from your accommodation the night before. Maison Bergoun Guest house Maison Bergoun is a bearnaise house built in VIII-XVIII century in the village of Borce at the start of your week's walking holiday. A small and welcoming guest house. Refuge Ilheou Mountain hut Refuge located at almost 2000m in the Ilheou valley situated by a beautiful lake. By train : Transfer by TER and bus SNCF from Pau to Etsaut, via Oloron Sainte Marie. - To get to Pau : line Nice - Toulouse - Irun, or line Paris - Bordeaux - Tarbes, stop at Pau. - To get to Oloron Sainte Marie : many TER trains from Pau to Oloron, then SNCF bus from Oloron to Etsaut. Contact SNCF www.ter-sncf.com or www.ter-sncf.com/aquitaine to confirm timetable. - By car: To get to Pau (autoroute from Bordeaux or Toulouse); then Pau, N134 to Etsaut, via Oloron Sainte Marie. NB: There is no hotel in Etsaut, and Borce is the village just next to it. - Parkings in Etsaut : No problems parking. Place de l'Eglise, infront of the Mairie or ask the manager of the gite in Etsaut. - Parkings in Cauterets : Free : Bus station, Place de la gare Thermes Cesar, (town centre) Guarded parking : Parking Municipal souterrain, Rue de Belfort. By train : Bus SNCF from bus station - arrival in Lourdes, 1h later. From Lourdes, conections with Toulouse, Bordeaux. Bus SNCF from Cauterets to Lourdes . From Lourdes, line Lourdes to Irun, stop in Pau. Then from Pau to Etsaut, connections possible with departures from Cauterets. www.ter-sncf.com to confirm timetable. We recommend arriving by train to avoid returns to Etsaut to recover your car, because the return journey is long by public transport and very expensive if you to take a taxi. If you have to come by car, we recommend that you leave your car in Hendaye on the first day and return by public transport because you will not be tired by a week's walking.